An important part of decorating a birthday party are the centerpieces, those cute details that not only serve to place them at the head table and those of the guests, as ornaments, but you can use them to place the goodies you want to share with attendees. If your decorating theme is the sweet Cinderella, here are some ideas for centerpieces that are sure to enjoy. The first is a small pot in which are Cinderella, the fairy godmother and the mice. 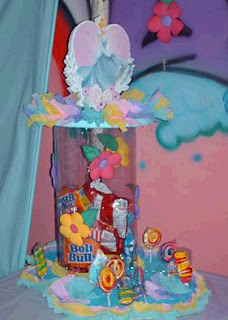 Interesting way of presenting the pacifier, it is a centerpiece with the base decorated with paper snowflakes amid Cinderella and on top, a balloon with ribbons. Another cute motif made based on balloons, at the bottom paper bowl decorated with the same material on the sides, spiral balloons in the middle, Cinderella, and at the top, another detail with balloons. And how about this interesting transparent candy dispenser? cute right?, to match the decor, at the top it has the image of Cinderella. Cinderella Centerpiece of two levels, decorated with paper and flowers, at the top, the princess. Cute centerpiece with Cinderella in the middle, on the sides, metallic balloons with ribbons and behind a balloon in the shape of the moon, the base is decorated with plush roles and spirals. 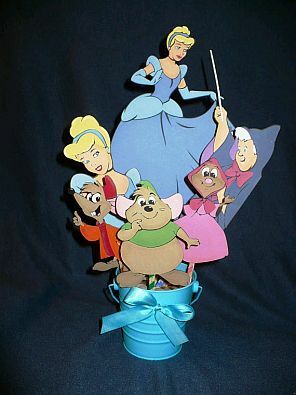 Centerpiece with Cinderella's face decorated with papers and flowers. Center with a large tray table in the middle you have the face of Cinderella, nicely decorated. 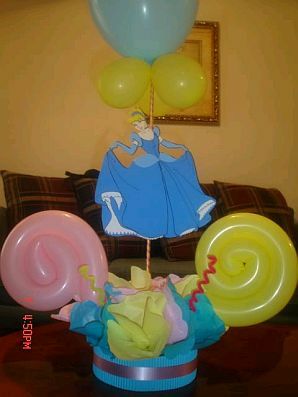 If you prefer to use balloons, this is an interesting idea, base have plastic plates adorned with the edge in the middle, Cinderella and on top a balloon with other small giifts inside.